The exit station accepts the tire from the test station, positions it for marking, and applies the high point or grade mark if an optional marker is installed. This item includes a manually operated drop gate that permits easy and comprehensive access to the test station for rim change, tire setup, and periodic maintenance. 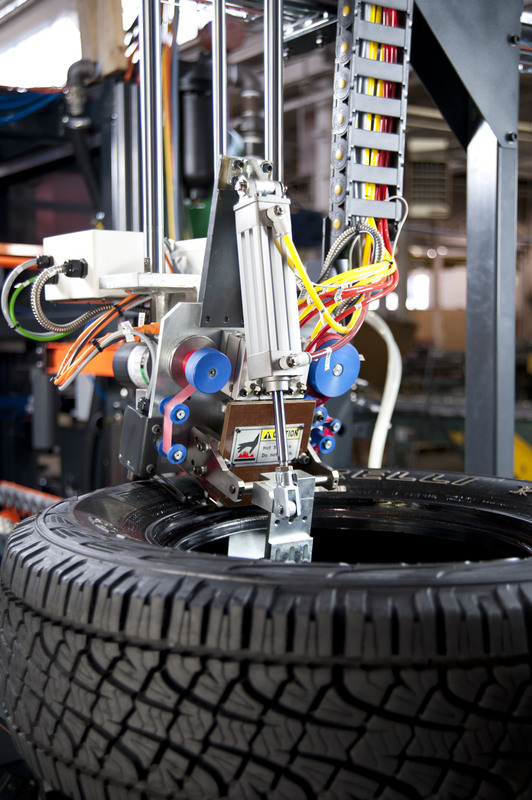 The tire is either taken off the line manually or can be sorted using an optional three position sorter. Tires are positioned in the test station for the proper marking orientation angle prior to transfer to the exit station. The exit station is a flexible arrangement so that customers can easily add markers according to their needs. Space is provided above and below for mounting markers. An easy-to-use ladder logic programming utility is provided for creating and revising sequence control code. This option uses two ink or AkroMARK™ hot stamp markers to mark the high (or low) point of radial harmonic force variation on the top or bottom side of the tire. When used as a combination (Top & Bottom), this can indicate the side of (+) or (-) conicity.